This topic provides conceptual information for the igScheduler™ control including information regarding: features, configuration, requirements and theming. The table below lists the requirements for the igScheduler control. Base Theme The base theme contains styles that primarily define the form and function for each widget. The table below briefly explains the main features of the igScheduler. 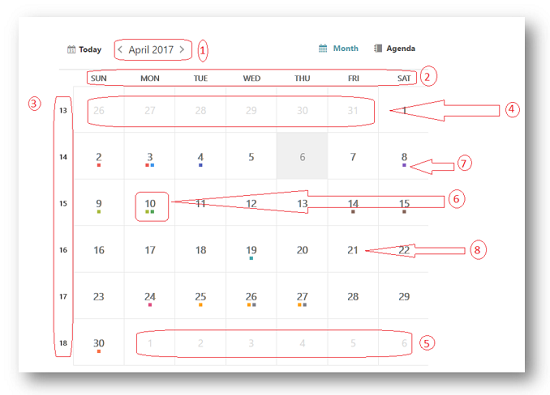 Views Тhe igScheduler can be configured to use agenda, month, week or day view, together and separately. The igScheduler control can be configured to present calendar information in different ways called "views". The view type can be configured using views and viewMode options. The agenda view of the igScheduler is visualizing the activities which occur during a specific time range. 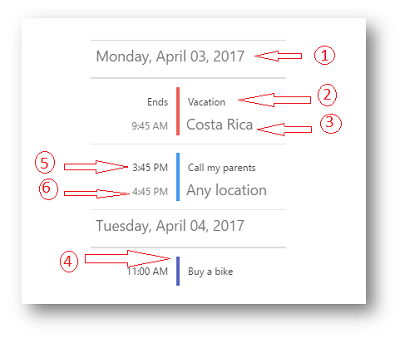 Activities are presented in the agenda view with their subject, location and times. If an activity has a resource associated with it and the resource has a color scheme set, this color will be used for drawing the vertical separator between the activity’s time and activity’s subject. The month view of the igScheduler is visualizing the days of an entire month. Each day is represented by a cell which may contain up to three activities. The month view also has the concept of the "selected day" which is displayed using different styling (foreground color, background color, font size or font style). Activity indicators. There indicators are rendered on days occupied with activities. Up to three activities indicators are rendered. The indicators are using the color set on the associated resource. The Week View of the igScheduler is visualizing all seven week days based on the currently selected day. This view contains time-slot segments with same length and different height based on the time range of the appointment. weekViewDisplayMode - Display mode. The week view can be configured to show all 7 week days or only the days configured as working days. timeSlotInterval - Time slot duration. Configure the time slots' duration. Currently 5, 6, 10, 15, 30 and 60 minutes are supported. workingHoursDisplayMode - Working days and hours. You can configure this view to display only working hours or all 24 hours. Shows hour-based view of the selected day, the hours are listed vertically going from top to bottom. This view contains time-slot segments with same length and different height based on the time range of the appointment. dayViewDisplayMode - Visible days. You can control how many days are visible at a time in the day view. Currently between 1 and 7 days are supported. This section provide information about the activities concept of the igScheduler control. The activities are used to represent an event which start at a specific time and ends at a specific time. Activities occur during a range of time with a duration of several hours, several days or even more. Subject Used as short description of the activity, it is the main information shown in the control’s views and therefore used to distinguish a specific activity amongst the other activities. Location Used to store the location where the activity takes place. From Contains the start date and time of the activity. To Contains the end date and time of the activity. Resource Used to obtain the resource associated with the current activity. Color scheme is used to highlight the activities associated with this resource. Description Provide more information about the appointment. The dataSource and resources options of the igScheduler are required for the data binding. 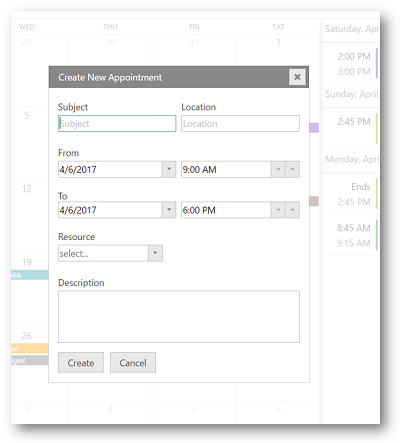 Each option need to be assigned an array that is holding the corresponding appointments or resources collection. Please refer to the Configure appointments and Configure resources topics for a more detailed overview.